Y’all know by now- I’m no stranger to comfort food. I can’t avoid it, don’t want to avoid it. Don’t even think I could turn away from it, even if I wanted to. And boy, do I not want to. I love it, my husband loves it, my kids’ love it. Shoot, they’ve been raised on it. Just like Mom’s wide-open arms on a bad day, and my listening ear- a good dish from my comfy kitchen is always a guarantee for them. There’s a few key ingredients for a quality, cozy meal in my opinion- a family favorite protein (and a large portion of it), a seriously starchy carb element (be it pasta, gnocchi, bread- you name it), and sauciness. Cheese if often an element as well, but not a necessity if the dish is done right. 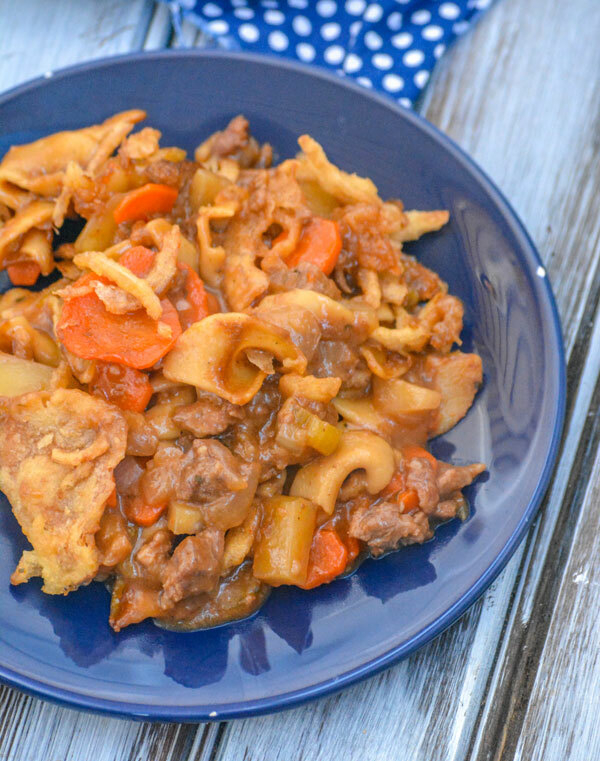 I’ve often found two fool proof methods for success in the family favorite, comfort food method- either a one pot meal, or… a hearty casserole. 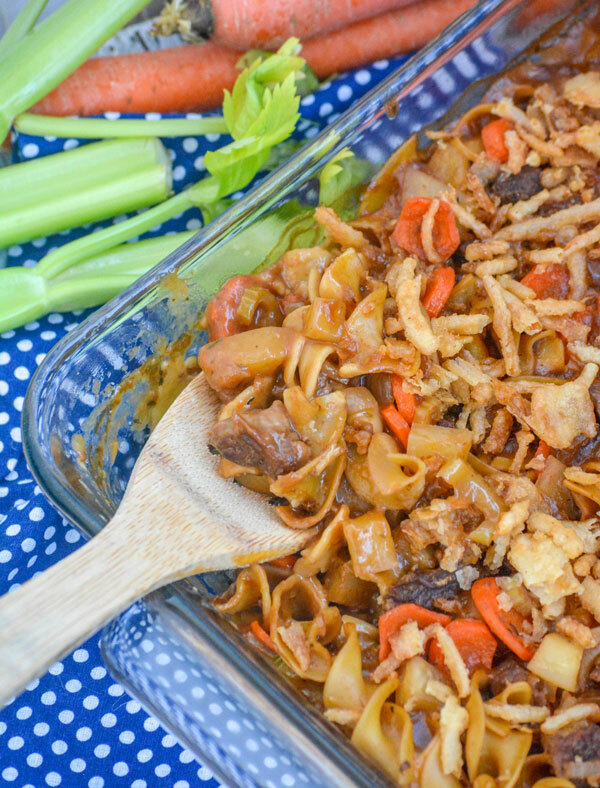 This Beef Noodle Stew Casserole touches all the right notes! It’s got a meat & potatoes feel, but made in a stew pot with the savory bits from a hearty beef and veggie stew. Nothing soup about it. It’s firmly in the ‘stew’ category, even when baked in a casserole dish. Your family will think you quite the meal magician when you serve them a plate of this, and let me tell you how easy it is to actually do! This recipe calls for stew beef. You can easily leave it whole, but I advise for chopping it even smaller so that all the bits get nice and seared. Most of the flavor is always in the seasoning. We also suggest celery and carrots as the primary veggies- a heaping helping of peas are a delicious addition. I confess I usually add them in. When am I ever gonna refuse an opportunity to get my kids to eat extra veggies?! Duh, never. LOL. Another pro tip, when I say ‘diced’ potatoes in the recipe, I mean diced. You don’t want a yummy casserole to come out of the oven, only to serve it, dig in- and then bite into a half cooked piece of potato. The smaller the’re cut, the better they will cook. 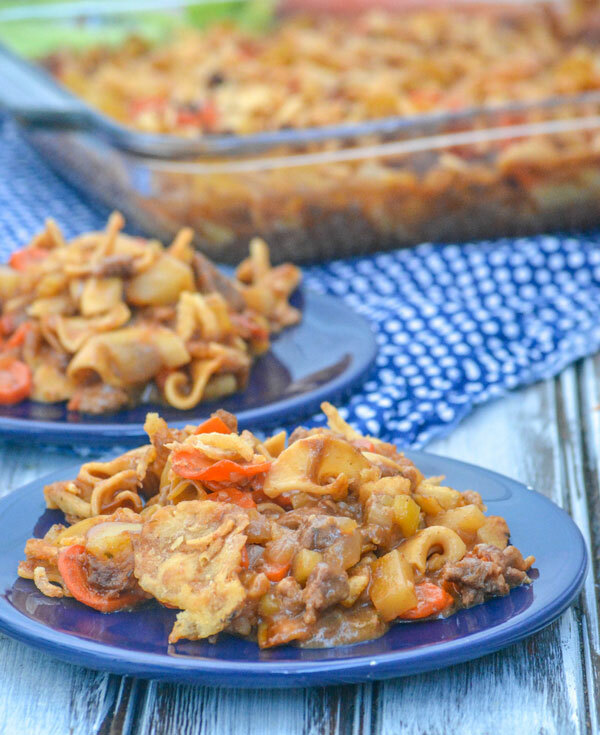 This Beef Noodle Stew Casserole showcases rich stew beef, comforting vegetables, and warm egg noodles baked in a rich, savory sauce. 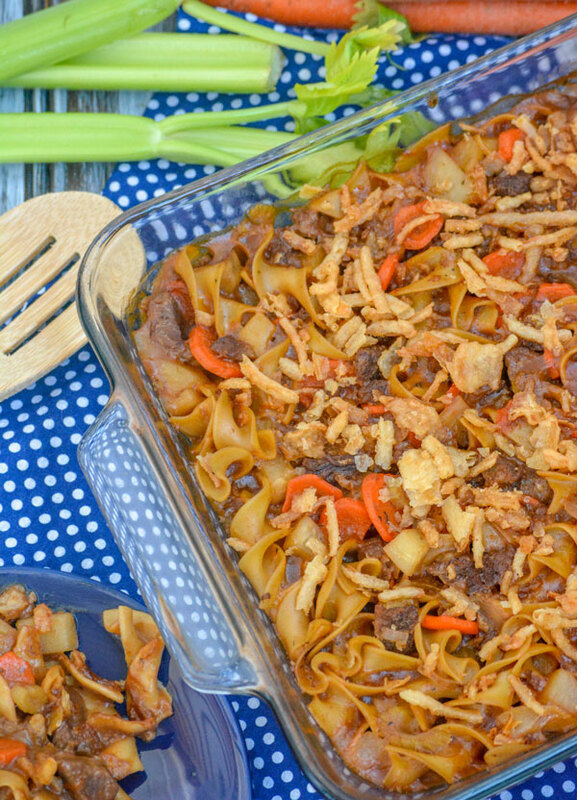 Topped with bits of crisp French fried onions- it’s an easy dinner dish the whole family will love. And truth be told, it’s a bowl full of the same flavor you crave in a comforting soup (minus the kids slurping) and without any mess. 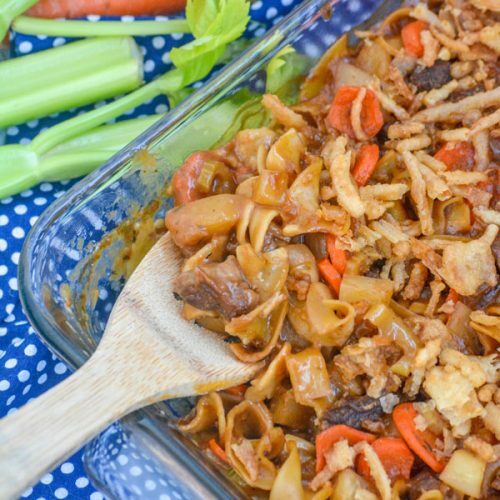 Our Beef Noodle Stew Casserole is a busy parents’ blessing, and one of those main dish dinners you will have on your recurring menu for years to come. 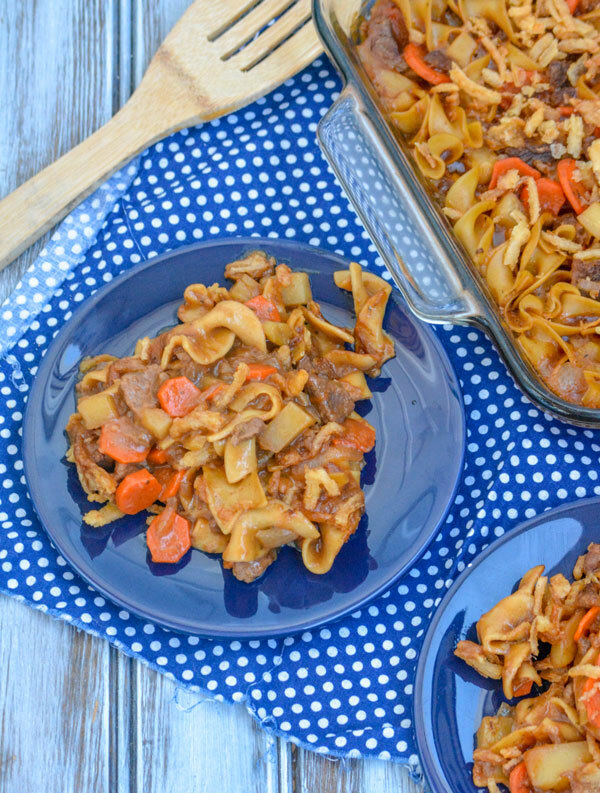 A hearty dish, this casserole gathers the flavors of a classic beef stew, stirs in a helping of egg noodles, and makes a delicious family dinner. To a large zip-locking bag, add the meat and flour- shaking to coat. Add the olive oil to a large pot set over medium heat. Sear the meat, stirring a few times, so that it's browned on all sides but not completely cooked through. Add the broth, and stir to deglaze the pot. Stir in the veggies, and bring the whole pot to a rolling boil. Using a whisk, whisk in the stew seasoning packet until completely incorporated. Continue boiling the stew mixture for 5 full minutes, until it's cooked down a bit. While the stew's boiling, cook the egg noodles until al dente, then drain. Stir the noodles into the stew. Lightly grease a 9x13" baking dish with cooking spray. Pour the stew/noodle mixture into the baking dish and cover it tightly with foil. Bake it at 350 degrees for 35 minutes. Remove the foil, sprinkle the crispy fried onions evenly out overtop the casserole, and return to the oven for an additional 5 minutes. Serve immediately, and enjoy! 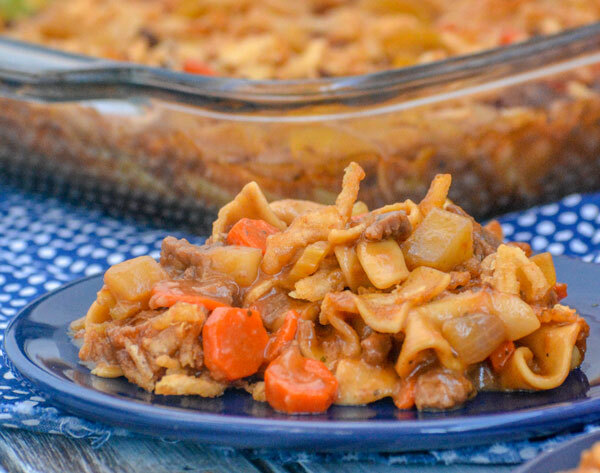 This looks like a heartwarming casserole/stew! My son would have loved this! Minus the onions. I would have just eaten his, lol!